La Buvette Scott is a hip and cozy restaurant in the equally hip St Jean Baptiste neighborhood just outside the walls of Upper Town. It was very interesting in that it was the best restaurant we visited that wasn’t our taste. With a limited menu featuring entrees like duck hearts we didn’t find much in our comfort zone. 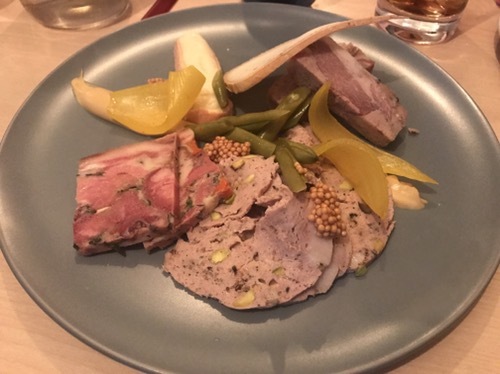 The food is all farm to table and items are all made in house like the charcuterie platter we sampled with superb mortadella. The panzanella salad had the sweetest tomatoes and the freshest mozzarella. Our adventurous friend had the duck hearts and he said they were excellent. If you feel in an adventurous mood definitely check them out.